1955 saw Stan Musial playing in his 14th big league season. In six of those seasons, Musial won the batting championship, establishing himself as one of the most feared and respected hitters in the National League. In fact, Musial’s unforgettable nickname of “The Man” comes from Brooklyn fans grumbling “THE MAN always winding up on base” when the slugger came to Ebbets Field. While some great hitters shone bright for a brief period before slipping back into mediocrity, Stan Musial only improved with age. Even after losing the entire 1945 season to the war, Musial emerged with a new-found power in his bat, reinventing himself as a home run threat as well as a line drive-hitting machine. By 1955, Stan the Man was 34 and consistent pounding out 30-35 home runs a year coupled with an average that hovered in the .340 area. 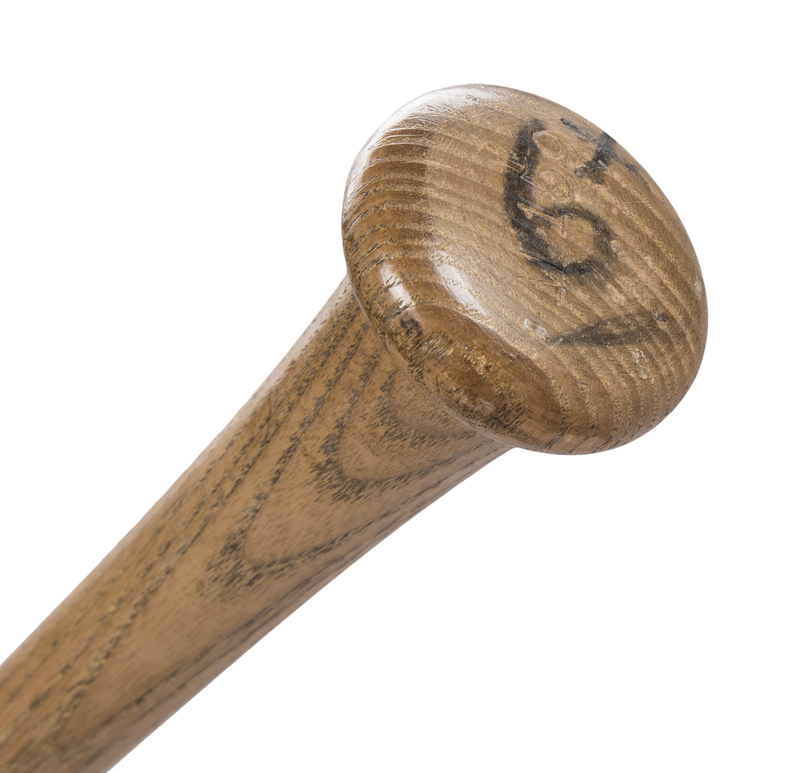 Even in his mid-30’s, Musial strived to improve his skills, and this 1955 gamer bears the marks his “practice makes perfect” attitude. 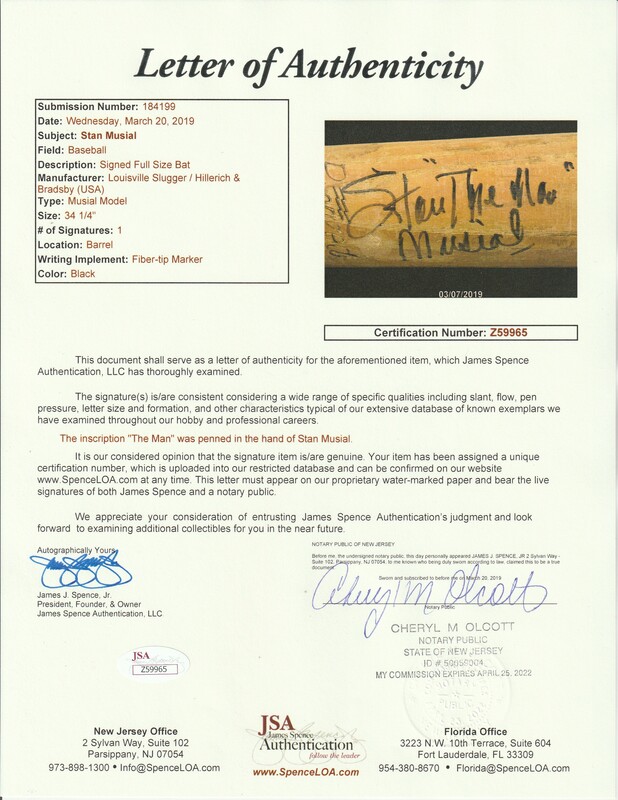 According to the letter of provenance that accompanies this bat, the owner obtained the bat from Stan Musial at the conclusion of a spring training game in 1955. 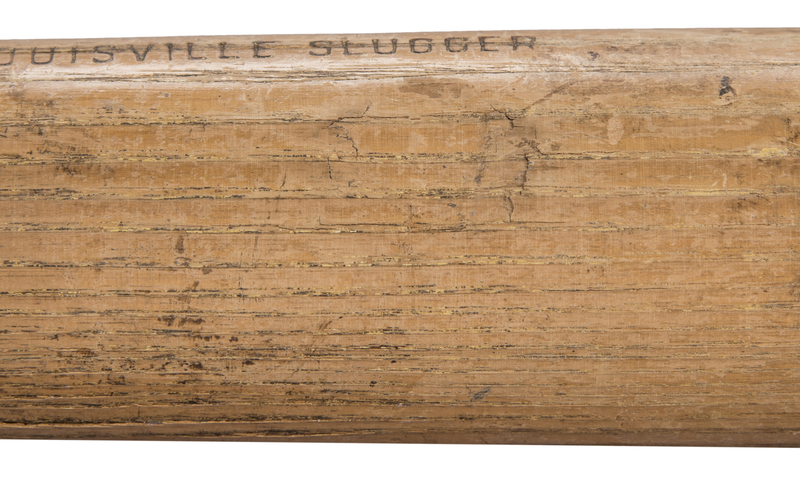 One can easily see from the heavy use on the barrel that this bat was used by Stan to fine-tune his famed corkscrew swing for the upcoming season. 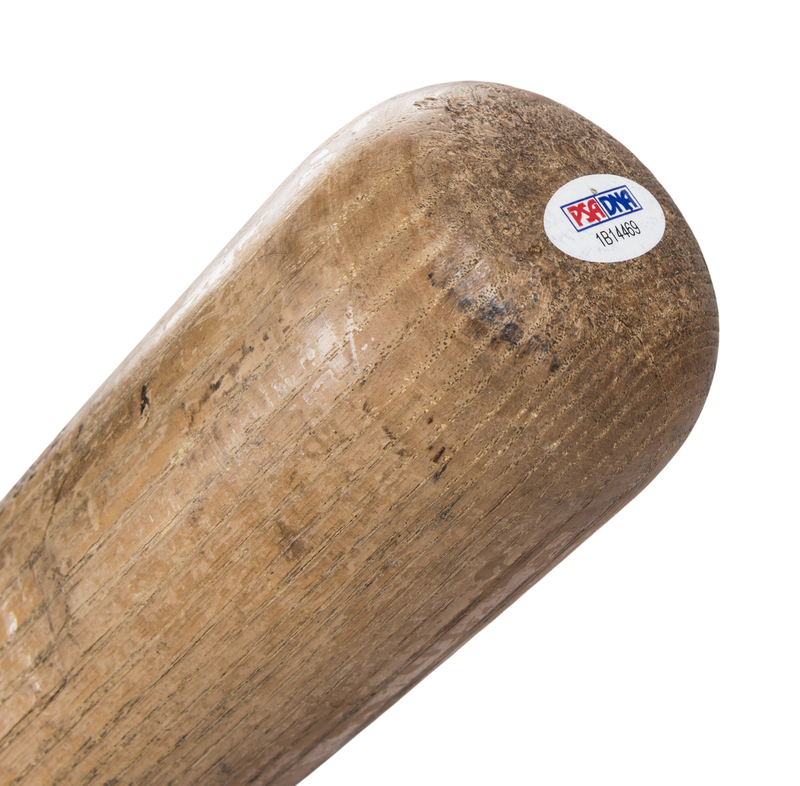 Stan’s Hillerich & Bradsby M159 model bat shows outstanding game use and is un-cracked. 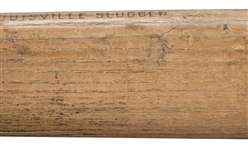 There are ball marks with stitch impressions found on all sides of the barrel and repeated ball contact has left some checking on the back barrel. There is a deep impression of unknown origin found on right barrel and the handle has been sanded down to enhance the grip. 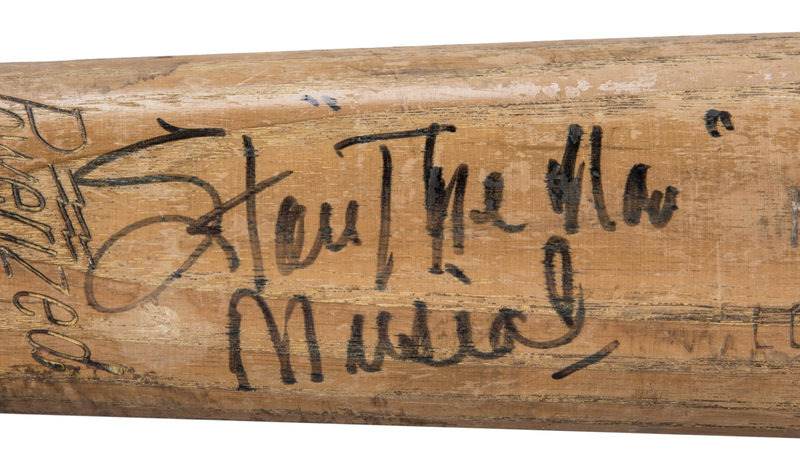 The model number “M159” has been stamped into the knob and Musial’s immortal number “6” handwritten in black marker. The ash wood has taken on a warm, golden patina in the years since it’s use, giving an attractive display appearance to an already historically significant bat. 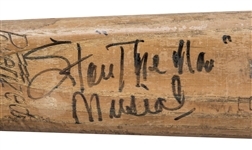 To complete this extraordinary Musial gamer, the Hall of Famer has signed the barrel between the center brand and endorsement in bold black marker “Stan The Man Musial.” This bat comes with a LOA from PSA/DNA (1B14469) for the game use and has been graded a near-perfect GU 9. There is also a LOA from JSA (Z59965) for the signature.